Is a Woman’s Happiness Linked to Her Father? February 3, 2014 Broadcast from Bianca on Vimeo. -How are Dads of daughters different than other Dads of sons? -Would you say that Guys that have Daughters are different kinds of guys? -What’s something Fathers don’t understand about their Daughters? -This is an obvious question but — why do Dad’s understand sons so much better? -In the Fathers you talked to — what were tough questions for them to answer about their relationship with their Daughters? 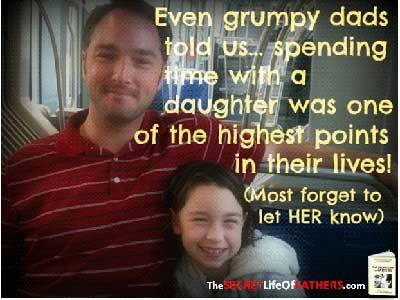 -What were the biggest eye openers when you started to talk to Dads of Daughters? -What tips do you have for Guys listening who want to raise healthy Daughters? ARE MEN BRAIN DAMAGED, and COULD DAUGHTERS BE THE ANTIDOTE? Where did you get the idea for a book on fathers? What makes FATHERS of daughters different from other guys? How does the brain-damage affect men? What emotions do men have the most difficulty with? Why is a daughter different from other women? How does a man change once he has a daughter? Are all men affected the same way? Would John Lennon have been different with a daughter? Did you interview any women? How are women affected by their fathers? In your interviews, what was the toughest question for guys to answer? James I. Bond is an award-winning behavioral management specialist and author of “The Secret Life of Fathers (2nd Edition),” An Unexpected Guide to Understanding MEN… and Fathers. He has written for Forbes.com and appears as a frequent radio talk show guest. +WOMEN wanting to improve their relationship with their dad — or — wanting a powerful and unexpected way to increase their happiness and success in life while improving how they relate to men. +MEN curious about the misunderstandings women have about what men are “really” like (what fathers of daughters show us about what men are really like). But also, men who are interested in understanding how deeply a woman’s father has affected her self-image and how she interacts with men… how understanding that could help a guy’s relationships with women. Do you really know your dad? How would your life be different if you knew what he was really like? 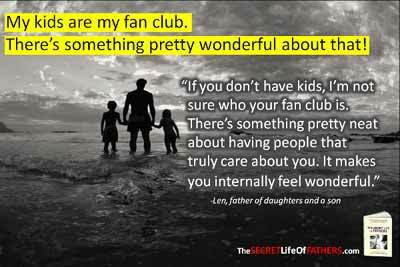 Welcome to “The Secret Life of Fathers” …what fathers of daughters teach us about what dads are really like beneath their carefully guarded image. Whether she realizes it or not, a woman learned much about what men are “really” like, and how she fits into a world mostly run by men, by watching and listening to the first man in her life, her father. But what if she missed something? What if there are secrets buried deep that most men will not share… secrets that could change a woman’s entire understanding of what men (and her own dad) are “really” like? In this lively discussion, behaviorist James I. Bond will take your audience on his incredible journey of discovery, into a world rarely seen by women—the private fears and feelings of men (as experienced through the eyes of fathers with daughters). Through all this, your audience will discover unexpected ways a woman’s self-image and how she interacts with men have been molded by the relationship she’s had with her own father. 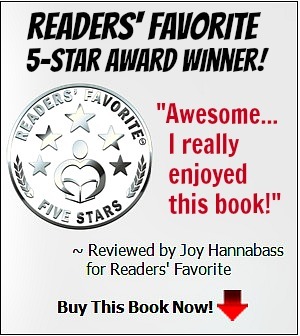 Most importantly, your audience will learn how hundreds of women have opened the door to unexpected happiness, often for the first time in their lives, by using these powerful secrets in their own life. 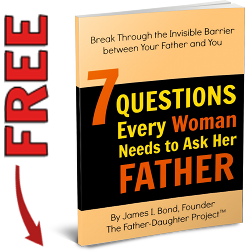 As a bonus, your audience will also find out where they can get their own personal copy of the book, “7 Questions Every Woman Needs to Ask Her Father,” absolutely free! February 3, 2014 Broadcast from Bianca Tyler on Vimeo. Help us change lives…starting with yours! James I. Bond is founder of The Father-Daughter Project™ (www.TheFatherDaughterProject.com), which was established to strengthen the relationships between fathers and daughters. He is also the author of the highly acclaimed book, “The Secret Life of Fathers” (From Intimate Interviews with 101 Fathers of Daughters). 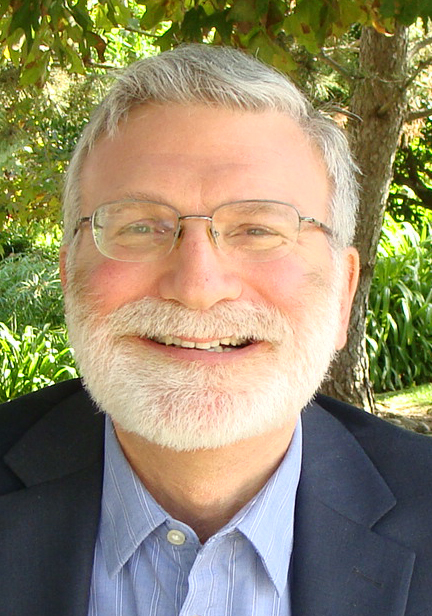 James has been a behavioral management specialist for more than 20 years, having worked with many of America’s largest organizations. He has also been in regional leadership for The Mankind Project (MKP), a non-profit men’s training and personal development organization. James and his wife Pam of 35 years reside in Thousand Oaks, California. For fourteen years, James I. Bond was president of a training and human development company, serving many of the world’s largest organizations. His firm was a pioneer in using behavior management to accelerate human development (getting people to change their lives by altering a few of their habit patterns). He had also been involved with The Mankind Project (MKP), a non-profit men’s training and personal development organization, which helped him better understand many of the issues and blockages that prevent men (and dads) from having better relationships with women and daughters. Eventually, James discovered his own relationship with Lauren, one of his three daughters, was not as close as he thought. The focus on his career combined with an indefinable barrier had somehow prevented him from being closer to her. James wondered if other dads were as clueless as him about their relationships with their daughters. So, he set out to ask dads across the U.S. and Canada about their own experiences and discoveries of being father to a daughter. Through the wisdom and experience of other dads, he hoped it would help him better understand what was going on between his own daughter and himself. Ultimately, 101 fathers of daughters agreed to be interviewed on recorded calls, covering about two-hours of highly personal questions. How has my relationship with my dad or daughter “really” affected me? How can I help others do the same? 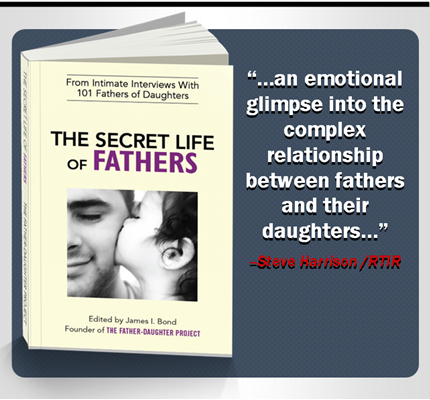 The quotes and stories from the interviews with these dads also became the basis for the book, “The Secret Life of Fathers” as a way to listen in as men chat with other men about a subject rarely discussed–the private fears and feelings of father of daughters. We believe the world will become more caring and compassionate by improving the relationships between fathers and daughters of all ages. We also believe that when a father and a daughter better understand their impact on each other, this can lead to greater happiness, health and success in surprising and profound ways, for both dads and daughters. 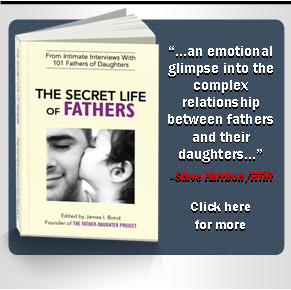 Through our highly acclaimed book, “The Secret Life of Fathers” (from Intimate Interviews with 101 Fathers of Daughters), as well as the numerous activities and events highlighted throughout The Father-Daughter Project’s website and resources, positive relationships between dads and daughters can be strengthened, providing an unexpected means for greater happiness and success. ~ OUR MISSION: FOR WOMEN and DAUGHTERS – Greater happiness and success in life! I believe most women have no idea how much their self esteem and how they interact with men throughout their life is affected by their father. I hope to change all that while giving women awareness and tools to help improve their ability to find happiness and success in life, far beyond what many may have believed possible. ~ OUR MISSION: FOR MEN – Better relationships with women! I believe most men don’t fully understand why women act the way they do… the subtle and not-so-subtle impact fathers have on a woman’s self-image and the way she interacts with men. I hope to change all that while giving guys an awareness of the most common misconceptions women have about what men are “really” like. 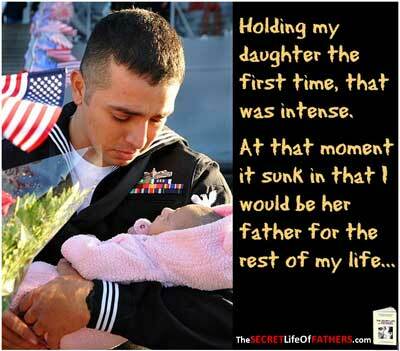 ~ OUR MISSION: FOR FATHERS – Healthier happier daughters! 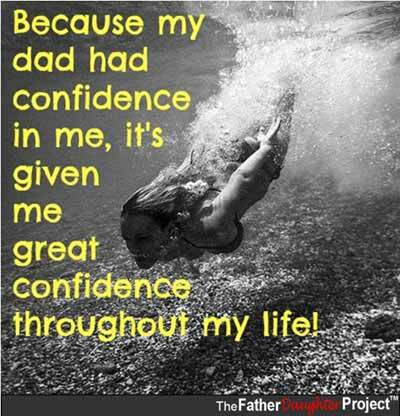 I believe most dads have no idea how much they affect their daughter’s self esteem, how she interacts with men throughout her life, and even her ability to find happiness and success. 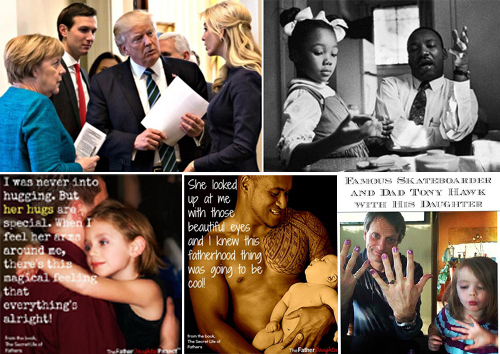 I hope to change all that while showing some of the powerful and magical things that happen when a man is a father to a daughter. ~ A Dad’s pain at having a Daughter with alcohol and drug problem – she’s finally clean for 7 years! ~ ABOUT THE BOOK, “THE SECRET LIFE OF FATHERS”: Here for the first time you get to eavesdrop on 101 real fathers of daughters as they talk about a subject rarely discussed–the private fears and feelings of fathers of daughters. Sometimes incredibly funny, sometimes profoundly sad, but always real… this has been described as one of the best training manuals ever for understanding what men are “really” like, by observing fathers of daughters.